Forget Bitcoin. It’s the underlying technology, blockchain, that is generating the most excitement. Even utopia! Bitcoin is a digital currency that was invented in 2009 by a person (or group) who called himself Satoshi Nakamoto. His stated goal was to create “a new electronic cash system” that was “completely decentralized with no server or central authority.” After cultivating the concept and technology, in 2011, Nakamoto turned over the source code and domains to others in the bitcoin community, and subsequently vanished. While Bitcoin (and other so-called cryptocurrencies, such as Ethereum, Ripple, and the other 1500 or so other such currencies) have generated a great deal of media attention (for their novelty, their ability to permit transactions beyond government surveillance and control, and their wild gyrations in price), it’s blockchain, the technology behind Bitcoin, that carries the utopian promise of remaking the economy and society. At its most basic, blockchain provides a decentralized database, or “distributed digital ledger,” of transactions that everyone on the network can see. This network is essentially a chain of computers that must all approve an exchange before it can be verified and recorded. * The technology can work for almost every type of transaction involving exchange-value, including money, goods, and property. It can also serve as the basis for a variety of other functions, from distributed cloud storage and the recording of property titles to authenticated voting and decentralized social media platforms. For some (such as Brendan Markey-Towler), blockchain technology makes it possible not only to envision, but to establish a viable pathway toward, a utopian alternative to contemporary society. On the face of it a mundane and boring technology for bookkeeping, blockchain is actually revolutionary because it makes the anarchist utopia a more realisable dream than has ever before been possible. At the very least it provides the strongest challenge ever posed to the monopoly of the state over the promulgation, formation, keeping and verification of institutions and the public record. The purpose of this essay is to investigate the conditions under which this might occur, and the dynamics of a society organised using blockchain technologies. According to Markey-Towler, blockchain can serve as the basis for organizing an anarchist utopia—”a society which is composed of groups formed entirely by mutual association and absent violence and coercion.” The idea is that the keeping of verifiable records via blockchain technology allows for the creation of a public record that is kept by everyone and updated by collective consent, which means there is no nexus of power (such as the state or monopoly corporations) that can be exercised to corrupt or use the public record as a tool of extortion. ** Even more, the existence of blockchain technology makes it possible to exit from existing economic and social relations and to practice, if only in a selected domain, a different way of organizing economic and social transactions. Thus, it permits a “sort of competition” for adherents between the two systems—one organized in and by the state, the other via decentralized distributed ledgers—and creates the possibility for individuals to choose the set of institutions associated with the alternative, blockchain technology. They are merely the latest in a long line—starting with the late-sixteenth- and early-seventeenth-century Pansophists (such as Tomasso Campanella, Johann Valentin Andreae, and Francis Bacon) through the utopian socialists of the early nineteenth century (especially Henri de Saint-Simon) through the numerous technological utopians of the late-nineteenth- and early-twentieth centuries (including Edward Bellamy, Henry Olerich, Edgar Chambliss)—of prophets of progress and the possibility of achieving utopia through the introduction and expansion of new technologies. Technology is the means for creating a perfect society. 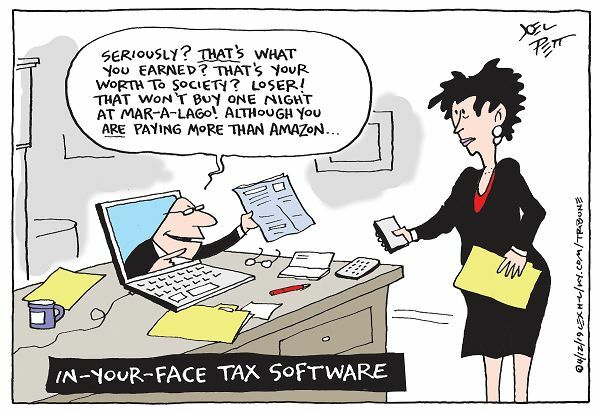 The perfect society itself is modeled on technology. The perfect society is one that promotes the development of new, better technologies. Clearly, Markey-Towler’s enthusiastic claims for blockchain technology meets the definition. So, as it turns out, does contemporary mainstream economics. Moreover, mainstream economists claim, an economic system based on free markets is the best way of encouraging the development and application of new technologies. At a microeconomic level, profit-maximizing firms have an incentive choose the best, more efficient technologies, for themselves and for the economy as a whole. And free international trade is the best way of increasing the pool of research and development experiments, from which the best technology is chosen. Thus, technology trade increases national income in each country and raises the total gains from trade. Contemporary mainstream economics thus combines market utopianism with technological utopianism. Relying on a technological fix that’s just over the horizon avoids the mountain moving required to wean ourselves off fossil fuels, bring hundreds of countries into agreement on how to limit and clean up emissions, and alter the consumption habits of an entire civilization. Those are systemic complexities ingrained in our economies and cultures. Propping up glaciers to limit sea level rise, sprinkling iron dust into the oceans to encourage plankton growth to absorb carbon, or spraying the skies to reflect the sun’s heat just seems simpler. Much the same can be said of obscene inequalities in the distribution of income and wealth, the “diseases of despair” that now afflict a large portion of the U.S. population, or the prospect that new forms of automation will eliminate jobs and make workers redundant. In each case, a technological fix is promised—tax-rate changes for inequality, the expansion of healthcare insurance for increasing levels of addiction, a universal basic income for labor-substituting robots—when the problem itself is political, not technical. 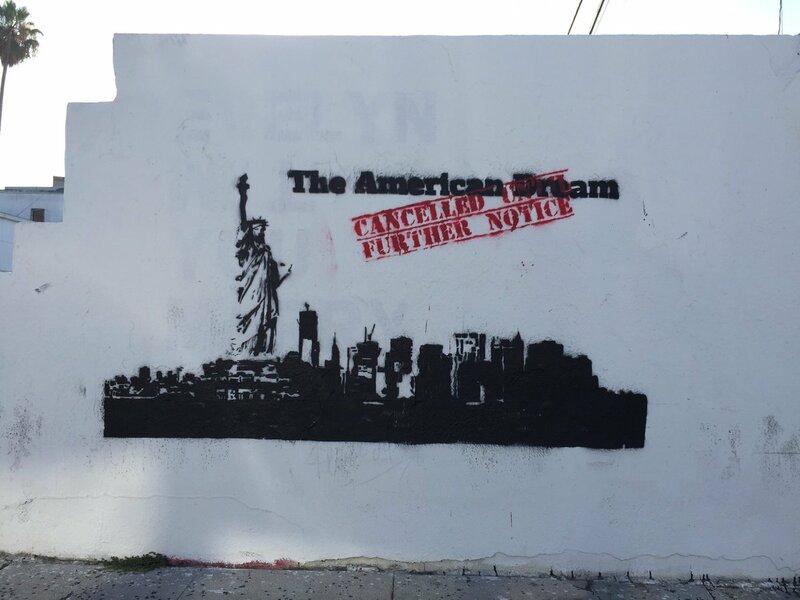 Tackling problems as deeply ingrained as the ones humanity faces right now will require facing a question that technology alone cannot address: are we willing to band together to criticize and change the existing set of economic and social institutions? *To carry out a transaction a party needs two things: a wallet (public key) and a private key. A wallet is a string of digits and letters, also called a public key. It is an address that appears each time a transaction is done. The private key is a string of random digits that should be kept in secret. When someone enables a transaction it is signed with a private key, which is only visible to a sender. Then a network of nodes carries that transaction making sure that it is valid. Once it confirms its validity the transaction is put into a block where, because it has been “hashed,” it is virtually impossible to change without being detected. 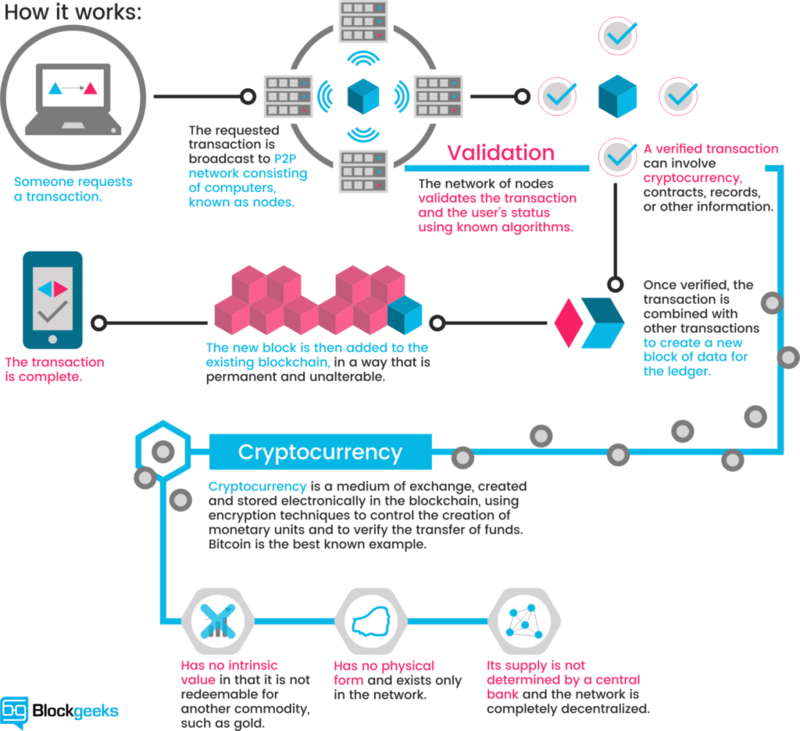 **Technically, blockchain fulfills three requirements: (a) it guarantees a certain degree of reciprocity and security with respect to exchange and property; (b) it is sufficiently easy to interact with and to keep records; and (c) it permits a certain degree of freedom to use one’s property, that is, it is secure from theft, corruption, and manipulation. ***Howard P. Segal, Technology and Utopia (American Historical Association, 2006), p. 66. ****Solow (1957) started with a neoclassical production function where Yt = At•F(Kt, Lt), where Yt is aggregate output in time period t, Kt is the stock of physical capital, Lt is the labor force and At represents productivity growth due to technology. Solow then estimated the variables for the U.S. economy for the period 1909-49, where output per labor hour approximately doubled. 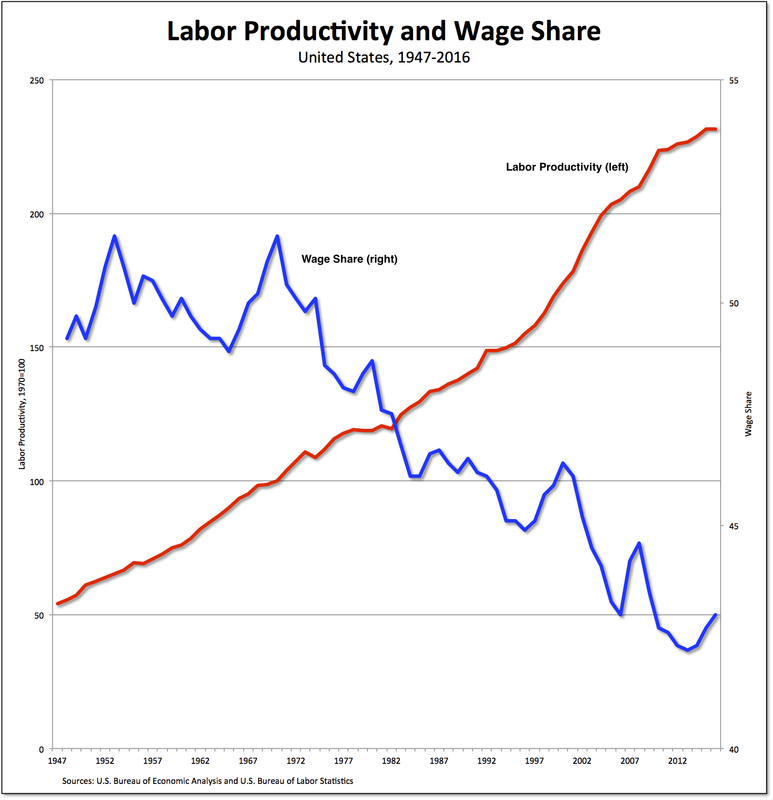 According to his estimates, about one-eighth of the increment in labor productivity could be attributed to increased capital per person hour, and the remaining seven-eighths to the residual. 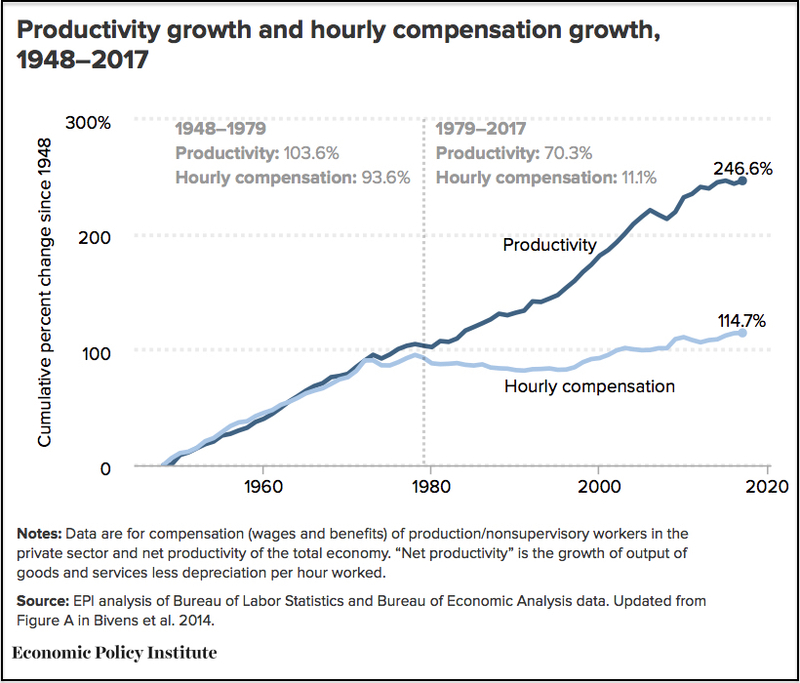 *****This is one of the reasons why Robert Gordon’s work on the slowing-down of U.S. productivity growth has been met with such concern. Must come down. . .
I’m not referring to karma or the application of Newton’s law of universal gravitation. No, it’s just the way capitalism works. Take the stock market, for example. 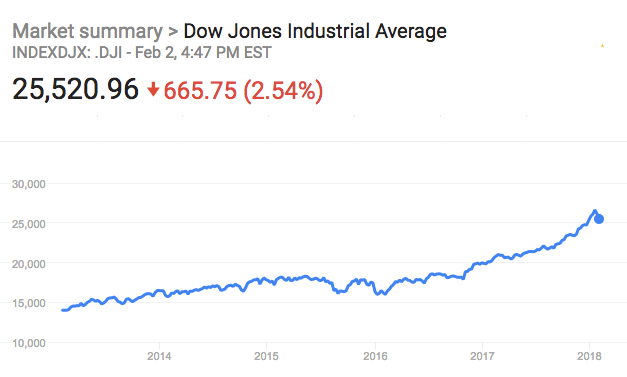 Last Friday, the Dow Jones Industrial Average closed down 666 points, or 2.5 percent, its biggest percentage decline since the Brexit turmoil in June 2016 and the steepest point decline since the 2008 financial crisis. The large decline is really no surprise, since the U.S. stock market—a thoroughly speculative institution within contemporary capitalism—has been on the rise, based on soaring corporate profits, since 2009. Rising stock values are related to corporate profits in two ways: First, they are bets on corporate profits, in the sense that stock speculators expect future prices to track the rate at which corporations are able to extract surplus and realize profits from their workers. Second, the profits themselves are distributed by corporations—internally, to buy back their own stocks, and to wealthy individuals (such as CEOs and recipients of dividends), who are in the position to capture their own portion of the surplus and use it to engage in speculative stock-market purchases. So, stock-market indices went up—and then, last week, they came down. 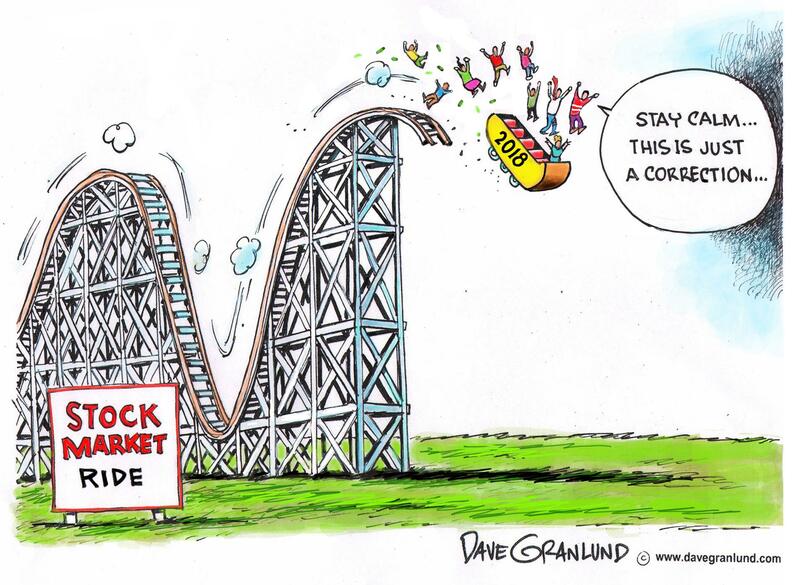 No one knows why the stock market plummeted, although there are many stories out there. One of them is the jobs report—indicating 200 thousand new jobs in January and an increase in workers’ wages—and the risk that the profit rate might fall. That’s another one of those up-down features of capitalism. And every time the profit rate falls, as if like clockwork, a recession or depression is just around the corner. 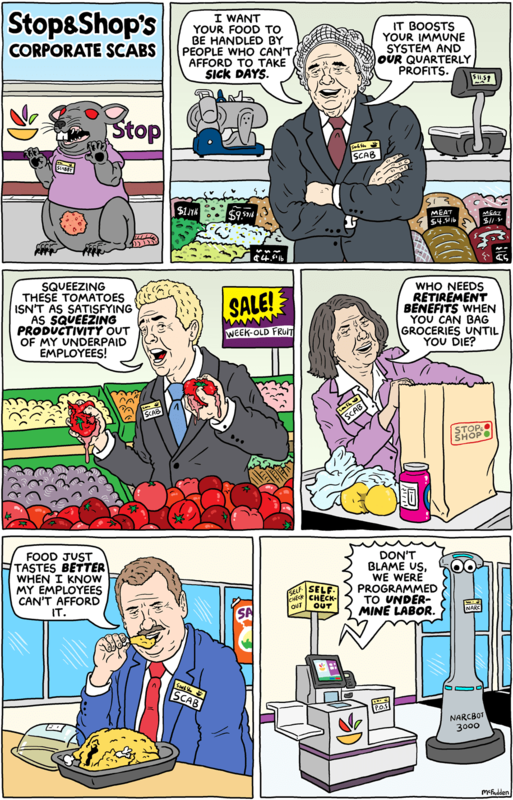 Corporations cut back spending, workers are laid off, and then—perhaps, always maybe—the conditions are created for another economic upturn. Here’s what’s interesting: while average hourly earnings for all employees on private nonfarm payrolls once again increased (in January by 9 cents to $26.74, following an 11-cent gain in December, and thus, over the year, by 75 cents, or 2.9 percent), average hourly earnings of private-sector production and nonsupervisory employees increased by only 3 cents (to $22.34, or 2.4 percent on an annual basis) in January—in both cases, just a bit more than the rate of inflation. And by another measure—real weekly earnings—wages actually fell (by 1.1 percent) during the last quarter of 2017. 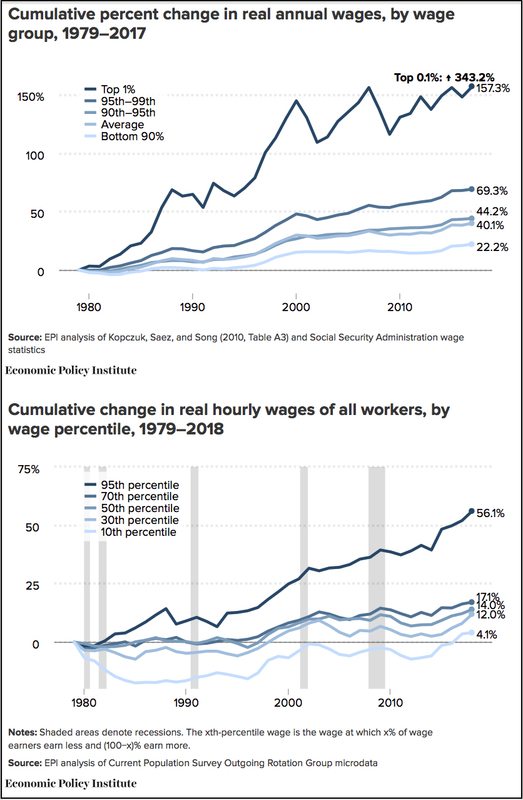 So, there’s no clear indication that workers’ wages are finally ready to take off (as mainstream economists and business commentators keep promising) or that they’ll make a large dent in corporate profits. 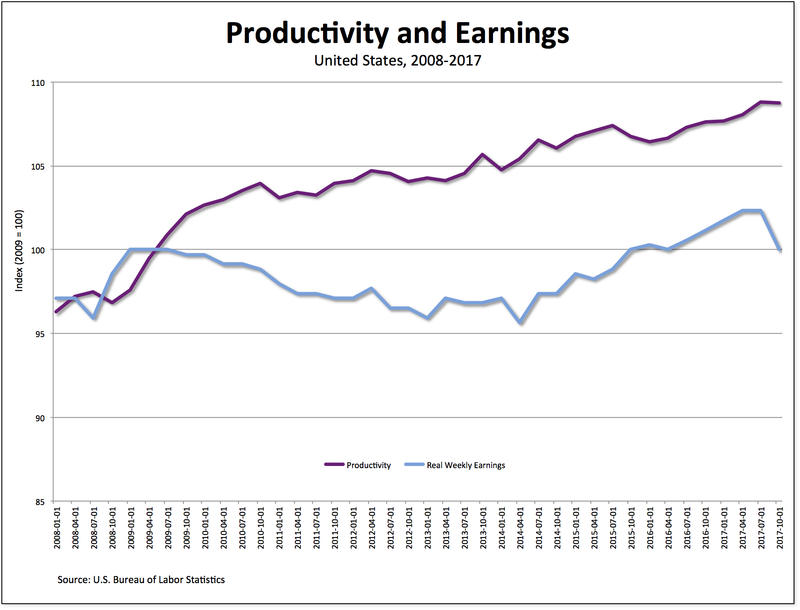 In fact, as is clear from the chart above, workers’ wages continue to lag far behind increases in productivity—literally no change compared to an increase of almost 9 percent, respectively, since 2009. Still, even the threat that workers’ wages might rise seems to have spooked the stock market, which tells us something else about capitalism: the members of the small group who, in terms of wealth and power, stand above the rest by benefitting from and betting on corporate profits are themselves no more than uncertain followers of the herd. Up and then down again. . .
Liberal mainstream economists all seem to be lip-synching Bobby McFerrin these days. Worried about the different positions in current debates about economic policy? Be happy, writes Justin Wolfers, and rely on the statistics produced by government agencies and financial firms and the opinions of mainstream economists. Me, I remain worried and I have no reason to accept mainstream economists’ advice for being happy. Sure, new forms of automation might lead to higher productivity and much else that Tyson and Lund find so alluring. But who’s going to benefit? If we go by the last few decades, large corporations and wealthy individuals are the ones who are going to capture most of the gains from the new technologies. Everyone else, as I have written, is going to be forced to have the freedom to either search for new jobs or deal with the fundamental transformation of the jobs they manage to keep. When it comes to separating fact from fiction, aside from the embarrassing epistemological positions liberals rely on, where are the statistics that might help us make sense of what is going on out there—numbers like the Reserve Army of Unemployed, Underemployed, and Low-wage Workers or the rate of exploitation. You want me not to worry? 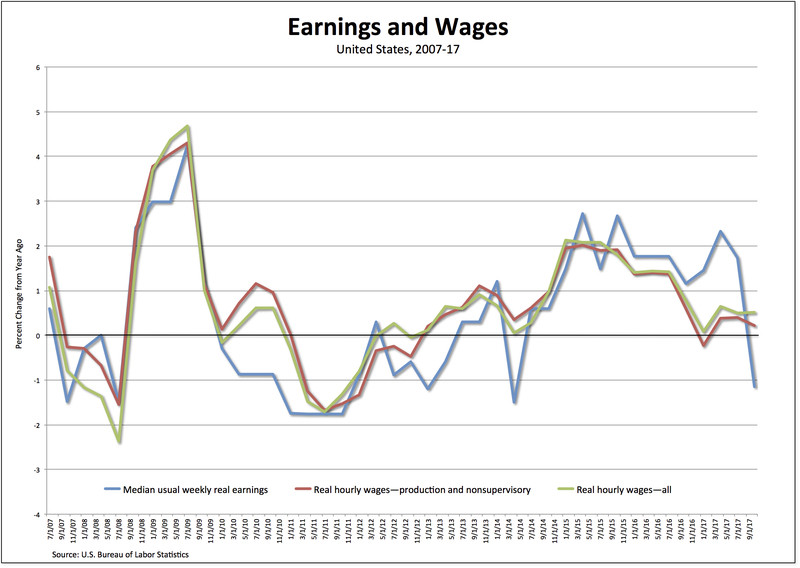 Analyze what’s going to happen to workers and the distribution of income as automation increases and calculate the kinds of economic numbers other theoretical traditions have produced. 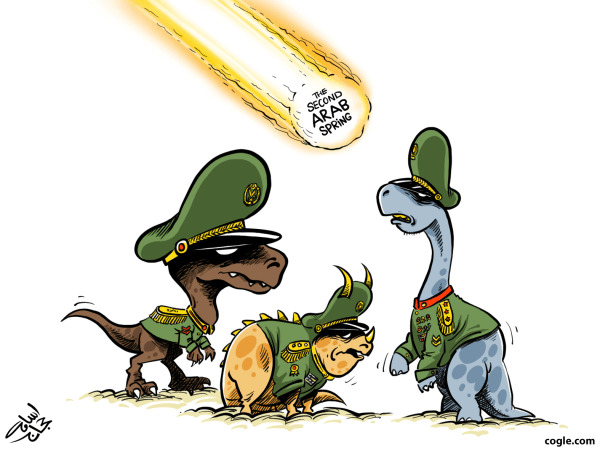 Even better, let workers have a say in what and how new technologies are introduced and change economic institutions in order to eliminate the Reserve Army and class exploitation. Then and only then will I be happy. But look at the numbers. Nonfarm business sector productivity (the blue line in the chart above) rose 1.5 percent (from the same quarter a year ago) while real hourly compensation (the green line) fell 1.1 percent. * The result is that unit labor costs (the red line) fell 0.7 percent. lighter regulation under the Trump administration and the prospect of a $1.4 trillion tax-cut package being passed by Congress are likely factors that have led companies to boost investment and become more productive. Corporations may have chosen to boost investment and become more productive—but they have also chosen not to compensate their workers. The only possible conclusion is that the Trump recovery is a recovery for employers but not for their employees. Let’s see if Trump or someone in his administration will tweet that! *Hours worked rose 1.5 percent and hourly compensation only 0.8 percent in the third quarter. As a result, real hourly compensation was -1.1 percent.